Hey, guys! Merzy here! Now as many of you know, I am very new to the whole blogging scene. I am pretty obsessed with reading posts that are titled just like this one is & I get sucked into reading them every single time. I love learning about new platforms and useful tools for bloggers, especially easy ones! So! As a fellow newcomer into the blog-o-sphere, here are a few websites & apps that will make your life easier! Canva - Canva is the BIGGEST lifesaver for making graphics EVER! Like seriously ever. I love this website so much it's insane. I use it for twitter headers, blog headers, blog photo titles, facebook headers, facebook posts, etc etc etc. They have premade photo templates for every single of these and so much more! It's just so easy and the biggest time-saver! If you don't use this already please do, it's flawless. Pixlr - I've been using pixlr since the photoshop free trial ended on my mac aka a looong time ago. The interface is beautiful (which is always a must) & it's honestly one of the best photo editing websites online. You don't have to create an account, you don't have to download anything! It's just great! Bloglovin + The App - Now, if you haven't heard of bloglovin' I'm going to do you a great favor and tell you all about it. Bloglovin' is the best blogging feed ever. The grand mayority of the blogging world is on there, it's easy to use and set up and the best part? There's an app! And it works! I love the bloglovin' app, I literally go on it multiple times a day to see what new posts I've missed. It's to save posts for later or organizing them into different categories! It's simply flawless. Get Site Control - Now, we're going to get a bit technical here. As a blogger, you need to have a way to get in contact with your audience. You also need your sharing buttons to be visible and working. What happens if you don't know code though? Lucky for you (and me), GetSiteControl exists. This website has all of these tools and more, you can customize pretty much anything about them and code them onto your blog easily with this site. 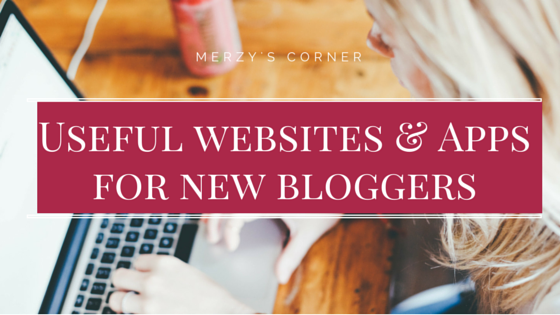 It's perfect for new bloggers which is why I always recommend them. MyMail - Have a ton of emails? Do they range from gmail to hotmail? Want them to be in one app only? Great! Me too! Which is why, MyMail is great! It works, it's pretty and fast! All of your emails in one place, breathe in a sigh of relief on that one. I know I did! Do! - Okay so this app is supposed to be a "to-do" list, but I don't use it for that at all. I mean, I guess you can use it for that too but I just use the reminders app for that. Anyway, I use this app for writing down blogging ideas and color coordinating them into different categories. I found this recently and I use it pretty much every day! Facebook Pages Manager - Recently, I made a facebook page (~shameless plug to get you to like my page here~) and I strong encourage everyone in the blogging world to create one even if you think you won't get any likes! Don't feel down because it takes you a while, alright? You're just starting! And remember to use #hashtags. Camera360 - There's a lot of photo editing apps in the app store and I'm definitely one to try them all as long as they're free. Camera360 is great because their filters aren't over the top, they're subtle and beautiful. They work for everything from selfies to blogging photos. Cropic - I've used cropic since I started my instagram and it's amazing. It's simple, it works and you don't get an annoying credit at the bottom of your photos. Sometimes my blogging photos don't fit on instagram so I use this to get the whole thing there! It's perfect! Thanks for the post! I'm definitely going to try some of those out. I've been using Canva already and loving it. One app that I love is FaceTune. I use it to whiten the backgrounds of my photos and they can end up looking so bright and beautiful.